A short break from Krabi posts to talk about something really important. So important that if you weren't prepared, the whole road trip will be a disaster. It's how to entertain the little monstah during a long distance drive. Timing is everything! The best timing is when the toddler is asleep! Me & hubs always choose to wake up really early in the morning to travel long distance. For Krabi we started the journey at 4am. For trips to Kuala Terengganu, for example, we woke up at 3am. You can also travel through the night, but we aren't really night owls.. so we prefer to catch some snooze before starting on a long journey. Also known as a snack & play tray. You can get it from Lelong.my for a cheap knockoff or look for the real thing at baby specialty stores. I got mine for RM20 off Lelong. The table is sturdy but not hard. This is important in case of an accident, the tray won't hurt the toddler. 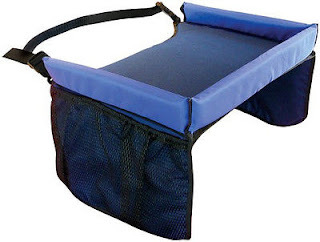 You can use the tray for activities, and for food. Very handy. I scoured the internet for ways to entertain a toddler in the car or flight. For kids above 5 years old, loom bands are a favorite. For 2-3 year olds, It's sticker books. I went to a few shops looking for sticker books, and I found one in Aeon Big for RM10. Sticker books kept Naila occupied for 30 minutes at a time. Mickey mouse sticker books does the trick! This works the longest. Naila has very limited screen time at home, so she's usually very excited for more. No complains when we let her finish a movie in the car. That's 1.5 hours off our hands. We wanted to bring headphones for her but forgot at the very last minute! When traveling, we allow things we don't usually allow, like eating chips and lots of biscuits. And kerepek. Or kerepet as Naila calls it. Plenty of milk cartons. Food saves the day when we were stuck at the Thai border for 3 hours. Also make sure to stop by for toilet breaks and freshening up every 2-3 hours. Makes all the difference in the world. Any other tips for long distance travel? Salam & Hi! 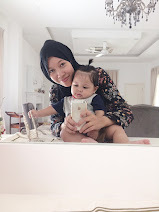 I'm Adilah, wife & mommy of 3, trying to live fully & healthy! To live, to die and in between.